Artist-in-residence Portia Cobb continues her exploration of her South Carolina roots as she responds to and extends the narrative first created by Fo Wilson, in Eliza’s Peculiar Cabinet of Curiosities, when she imagined a 19th-century enslaved woman and what she might collect in her living quarters. 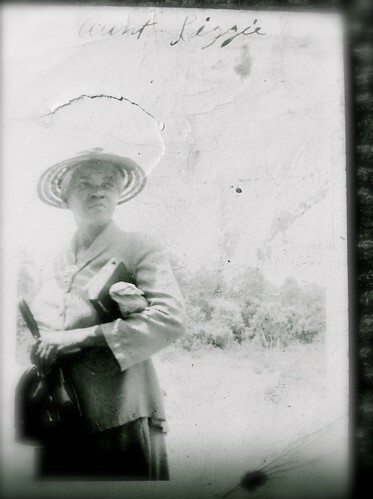 Cobb has conjured “Lizzie,” a Gullah-Geechee woman, descended from Africans captured along the coast of West Africa. By Cobb’s reckoning, Lizzie was born in coastal South Carolina 20 years after the American Civil War and 10 years following Reconstruction. Lizzie is a woman born free, descended from survivors of slavery, who is independent and living within a newly emancipated community. “Lizzie” also honors the memory of Cobb’s great aunt Elizabeth Ashe-Smashum (1887-1976). As the only girl in a family dominated by brothers, Aunt Lizzie became the caregiver of nieces and nephews, creating stories and involving the children in directed performances and recitations of selected works by African-American writer Paul Laurence Dunbar. Following the death of her husband, Aunt Lizzie introduced “Uncle Pomp,” a ghost-hobo character who emerged, mounted on a horse, when Aunt Lizzie needed to entertain or exact obedience. Cobb takes this opportunity to re-imagine Lizzie, her aunt, and Uncle Pomp. This is a Call & Response event.